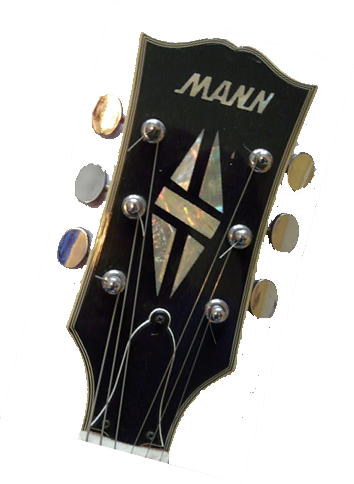 MANN guitars were distributed only in Canada by Great West Imports who was headquarted in Vancouver. MANN guitars were sold from approximately 1971 to 1985. The first generation (1971-1976) were made in Japan and there was probably enough inventory to last into the late 1970s. The second generation (1980-1985) were made in Korea. The first generation was closely tied to the Ibanez brand. The early MANN guitars were made in the Fuji-Gen Gakki factory in Japan, the same as Ibanez and many other brands. I am uncertain as to whether Great West Imports contracted directly with the manufacturer or with the distributor, Hoshino Gakki. These guitars are almost identical to the Ibanez models of the same era. This is the era of the lawsuit guitars or technically, pre-lawsuit, where they are direct copies including the headstock shape and design. The second generation was made in Korea and I have no knowledge of the manufacturer. The guitars made during this time vary quite a bit in quality. These are not lawsuit guitars and have no ties to Ibanez. I have a calalog of theses models under the catalog tab. Does anyone know what happened to Great West Imports? The 1960s was a period when the guitar became an important symbol of American popular culture. This attracted corporations who knew little about the instruments to buy the well known brand name manufacturers, namely Fender and Gibson. The new corparate owners, CBS and Norlin, allowed their products to become somewhat mediocre. This lead to the emergence of copy guitars from Japan which used arguably better parts and craftsmanship at that time. Many of the first Japanese guitars to reach western markets were cheap, entry-level models designed to capture the burgeoning guitar market. In Japan, where appreciation of American culture was widespread, the original Gibsons and Fenders were hard to find and prohibitively expensive. But by the end of the 60s, companies like Fuji-Gen Gakki and Tokai Gakki began creating fairly faithful replicas of the vintage-style Les Pauls, Strats and Teles that the marketplace had come to admire. One of the early companies to import these quality copy guitars was Elger Guitars. Elger distributed guitars from the Hoshino Gakki company. These guitars were made by Hoshino's longtime business partner, Fuji-Gen Gakki, and marketed under the brand name Ibanez. In 1971 Hoshino bought Elger Guitars, which became Hoshino USA. Hoshino produced not only under the Ibanez name but also with names like Greco, Starfield, Mann, Penco, Degas, Morris, Aria, Mansfield and others. In many Ibanez catalogues, you find pictures of guitars with no name on the headstock so Ibanez could use these catalogues with different brand names on the front cover. Their logos and production styles were similar enough to where American guitar companies felt that the consumer was being confused into buying guitars which they believed were from them. The famous lawsuit resulted that lead to changes in the production of these low-cost, high-quality guitars. The actual lawsuit began in 1977 and was between the Norlin Corporation (Gibson's parent company) and Hoshino USA. Gibson accused Ibanez of copying their headstock design. The issue was settled out of court. In 1978 Hoshino abandoned the idea of copying popular American guitar models and started manufacturing guitars from their own designs. Ibanez began changing the shape of their headstock in 1977 to the current "tulip" shape and the era of the "Lawsuit" guitars was over. The so-called "pre-lawsuit" Ibanez guitars with the "open book" headstock are more sought after and, therefore, more valuable than the "post-lawsuit" ones. More and more collectors are getting interested in these vintage guitars, primarily because of the internet exposure they get. Do they have a high vintage value? Not compared with the originals, but prices are going up!